We are familiar with the genesis of "Goodbye to Love," whereby Richard heard the song title in a movie (with no accompanying lyrics or melody) and decided to write a song based on the title alone. Well, Ed, you have your work cut out for you with "Good Eye to Love!" I have to admit, though, that I'd be kind of be interested in a song called "Good Eye to Love". I don't blame you. Some people would be cool with it as a conversation piece if it doesn't cost too much, something to have a good laugh at, but I can understand wanting to stick with authentic stuff in a collection. ...and not feeding the bootleggers. There's no way the seller doesn't know what he/she is trying to pass off. The buyer ought to be wise too, unless they enjoy listening to the Corpenters in their Horsche 911 and wearing their Dolex watch. Song4uman and ThaFunkyFakeTation like this. I didn’t even think about there being such a thing as a bootleg vinyl. I remember seeing on DVD an episode of the 70’s Hardy Boys/Nancy Drew series and an episode dealt with record piracy and in the episode the pirate was getting a cart copy from a local DJ and making records from the cart. Well, think about that for a minute. Could the sound be "better" than a legitimate LP or CD? I think not. Whatever source the bootleggers used would not be as good as what A&M/PolyGram/Universal has already issued over the years. They, after all, have the original masters with which to make the legitimate media. Nope, bootleg and/or counterfeit recordings could only at best be the same as a legitimate issue, usually worse. As a great example, look at all of the many issues of the HORIZON songs that have come out over the years in Europe and elsewhere. They are always reported as sounding muddy. leadmister and CARPENTERS-COLLECTOR like this. newvillefan and leadmister like this. I've had my eye out for this for some time, but unfortunately it's even more rare than the Looking For Love single. 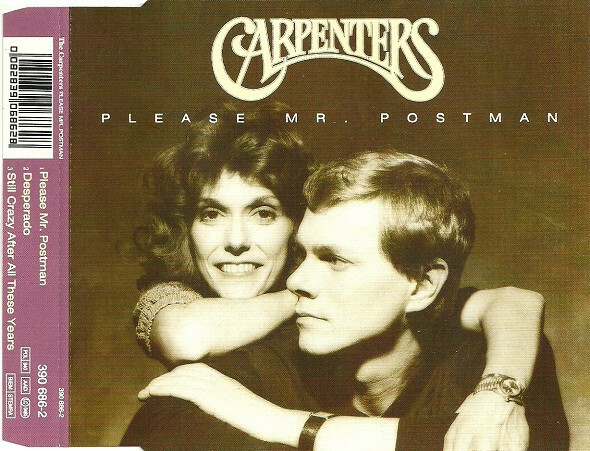 Nevertheless, it's a piece of Carpenters history that I must possess and hopefully will one day. Yep. Muddy sound, reversed stereo channels, odd track listings that are just a hodgepodge of the compiler's favorite Carpenters tunes, or tunes that they think would sell a lot of copies of the bootleg, etc. There is always something odd about such albums and sound wise, they can only come close to the original pressings but never surpass them. Does anyone own this rare German 3 track CD Single? What an unusual choice for cover art. Just added those images to Discogs. ^^ Love those combination of songs. Really shows the diversity of what Karen could do. And Richard as arranger and producer (on the first two). I wonder why the logo on the actual CD is not the official logo but it's on the cover art. What mix of Please Mr Postman? I think I may have picked it up on one of our trips to Germany. The disc face is a plain one that was common on some earlier CDs. I suspect that because this was a CD maxi single, a sort-of new thing, they wanted to cut expenses by using a generic disc face. Just a guess, but a fair number of early discs have rather plain disc faces. John Adam, newvillefan and leadmister like this. That's a beautiful rarity. They missed a good opportunity to put a Horizon-era picture up, but they could have been restricted on their choices for all we know. Lovely item! Thanks for posting the pictures.